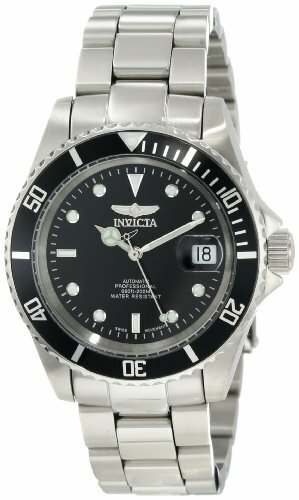 A clean black dial distinguishes this durable, dark-hued Invicta Men’s Pro Diver Collection Coin-Edge Swiss Automatic Watch. 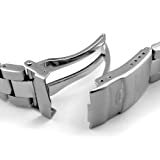 A polished stainless steel band joins to a durable stainless steel case that’s topped by a black, ion-coated, unidirectional coin-edge bezel that is imprinted with white indexes and Arabic numeral minute indicators in increments of 10. The striking black dial is protected by a scratch-resistant, sapphire-coated window, showcasing luminescent geometric hour indicators that complement luminescent, silver-tone hands. Small white minute markers and a date window at the three o’clock position complete the look of the visually appealing dial. This Swiss-automatic diving watch is water resistant to an impressive 660 feet (200 M) and is presented in a yellow Invicta gift box along with a buffing cloth. 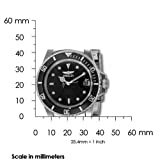 Screw Down Crowns : Many Invicta watches are equipped with a screw down crown to help prevent water infiltration. This is most common on our Diver models. 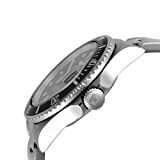 In order to adjust the date and/or time on such a watch, you must first unscrew the crown before you can gently pull it out to its first or second click stop position. To do this, simply rotate the crown counterclockwise until it springs open. 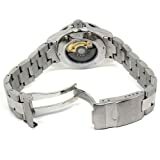 When you have finished setting the watch, the crown must then be pushed in and screwed back in tightly. Not doing so will cancel the water resistance of the watch and will void all warranties from the manufacturer. Overall, this process should not require a lot of effort or force.